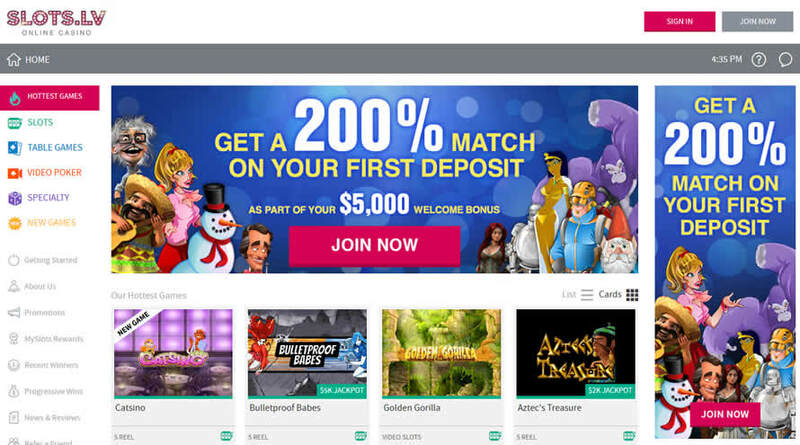 Since first launching in 2013, Slots.lv has been giving players a great mix of promotions, games and other options that have driven them to a high level of popularity. They are known for being extremely friendly to US players, which makes since because the “LV” in their name is a reference to Las Vegas, the largest gambling city in North America. They are also licensed by the Kahnawake Gaming Commission, a well known and trusted jurisdiction. Moreover, they’re owned and operated by Lynton Limited, a company with its own great reputation for taking care of players. As the name of this site suggests, they focus primarily on slots, but they have a lot to offer every type of player, particularly if you want to deposit and cash out in bitcoin. Casino Bonus: 200% up to $1,000 on first deposit, then 100% up to $500 on your next 8 deposits for a total of $5,000 free bonus cash. Aside from offering regular bitcoin-specific specials that are great deals on their own, players can also get thousands of dollars in special offers just for signing up and depositing. On your initial deposit, you can use the HELLOSLOTS200 promo code to get 200 percent worth up to $1,000. On the eight deposits you make after that, use HELLOSLOTS100 instead to get 100 percent up to $500 on each of those deposits. That’s a total of up to $5,000 in rewards for signing up and depositing, which is a welcome bonus package that you’ll have a hard time matching anywhere. There’s a simple 35x wagering requirement on the deposit and the bonus amount for all of these offers, and while all games contribute to the play-through, some games contribute at different rates. Bitcoin players typically find themselves at sites with limited software options at this stage in the progression of the industry. Slots.lv takes a different approach that focuses on giving players as many options as they can. That’s why they have titles from BetSoft, Rival Gaming, Realtime Gaming and their own proprietary software. This gives players a tremendous mix of options when it comes to game selection, but because all of these games work together really work on the software side, it also makes it easy to connect and play no matter what kind of computer or mobile device you have. In the same way that bitcoin takes advantage of modern technology to give players as much convenience as possible, the same kind of thing happens with the Slots.lv software platform. You can connect using your web browser, as long as you have it updated, and this means you can connect from Linux, Windows, Mac or any other modern operating system. The same goes for mobile players who can use their native apps or connect through their mobile web browser on any smartphone or tablet, regardless of the brand, as long as you have an Internet connection. As the name implies, this online casino is largely focused on the slots side of the situation. Along these lines, you’ll get to play games like the i-Slots from Rival Gaming, which are titles that immerse you in the game’s fictional universe while you play through a storyline that can unfold differently each time you play. You also have access to the Real Series from RTG, games that all have progressive jackpots, great bonus features and a wide range of themes. The slot selection is rounded out by the extremely high-quality titles provided by BetSoft, known for producing some of the most visually appealling games in the industry as a whole. This just goes to show that you’ll get a variety of different styles and approaches to the games, though they’re all great and can be played with bitcoin at this online casino. You might not think that a site named something like Slots.lv would have much to offer in the table games department, but that couldn’t be further from the truth. They have plenty of table games to choose from, and this includes classics like Baccarat, roulette, blackjack, video poker and plenty of casino poker games. It’s clear that players who prefer a bit of strategy in their games will have plenty of options to wager on those titles in bitcoin. Other options like keno and scratch cards can also be played with a number of different options in each genre of title. Overall, there aren’t as many table games as slots, but that’s the case at virtually every single online casino running today, so it’s well within the industry standard. In any event, there are tons of games to play in every genre no matter if it’s slots or table games at Slots.lv. Banking is made really easy at Slots.lv with an emphasis on bitcoin for deposits and withdrawals. There are no fees when you deposit in bitcoin, and they have low minimum transaction sizes as a result. A handful of other banking methods are also available like credit cards and money transfer services. Once you get a bitcoin wallet set up and funded, however, bitcoin is just as easy as either of these other options, and they tend to give faster withdrawals to bitcoin as well. This site is very reliable for withdrawals, regardless of the banking option that you prefer, but bitcoin still has a number of advantages. The support team is available 24/7/365, which is important in case you have questions about making a bitcoin deposit. They have plenty of specially trained individuals whose job it is to walk people through bitcoin deposits and withdrawals on a daily basis, so they have plenty of practice when it comes to making sure that you’re being taken care of. You can contact them through an email contact form or through the live chat service. Again, both of these options are available around the clock, so you’ll never be left out from being able to enjoy your online casino experience when you play with Slots.lv.